Quest for the Best Amateur DanceSport Competition | Experience competitive ballroom dancing with us! A full spectrum of all-amateur events at modest cost for all ages, styles and skill levels including mixed proficiency and formation teams. Mixed proficiency events now include Newcomer through Pre-championship skill levels. Pre-teen and Junior events have been split into Pre-teen I and II and Junior I and II age categories, as they are at regional and national championships. Please note that National rules only allow Preteens to dance Newcomer through Gold skill levels now. Gain important competition experience without winning your way out of your skill level prior to USA Dance NQEs or Nationals! As a Registered USA Dance competition, you do not accrue points that apply to upper level comps. We’re gearing the evening session for great spectating featuring our most popular and highest skill level events, all adults, and formation teams. Refer to the schedule for current start times. Optimized for formation teams. Seattle audiences love formation teams and we have booked a large facility to better welcome them. Both competitive or exhibition events offered. Judges marks and comments provided. More info. Entry deadline: Thursday, January 17, 2019, 11:59pm. Competitors: $25/person, purchased only at the door, $35/person at VIP tables*. Spectators over age 12: $15 standard seating, purchased at the door, $25/person at VIP tables*. Youth spectators under age 12: Free in standard seating areas, $25 at VIP tables. 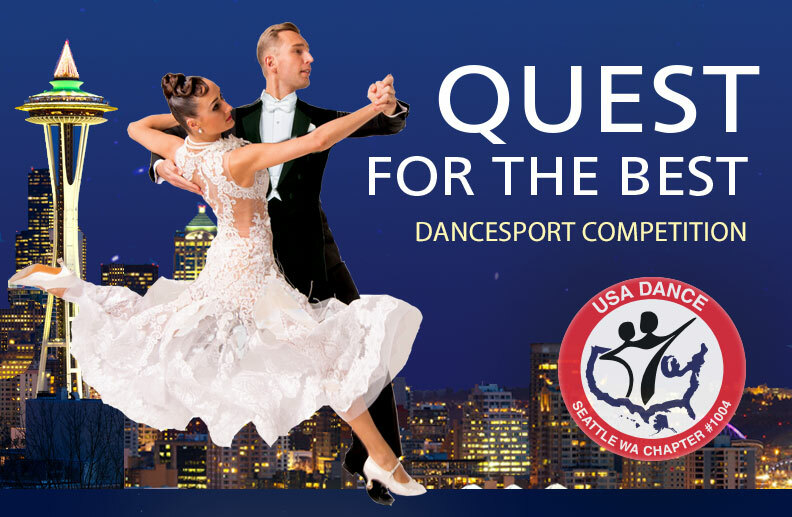 USA Dance Seattle offers this in order to expose more youth to DanceSport! Tickets can be purchased only at the door with cash or check. No credit cards accepted. Four VIP tables, each seating 6 will be available for pre-sale on a first-come basis. See the VIP tables webpage for more information. The Quest for the Best is organized by committee. Please contact the organizers and and questions will be referred to the appropriate person. (In downtown Kent near the Kent Station Shopping Center and ShoWare Center).